A Thunderbolt 3 port can be used to connect a wide range of peripheral types to your computer. 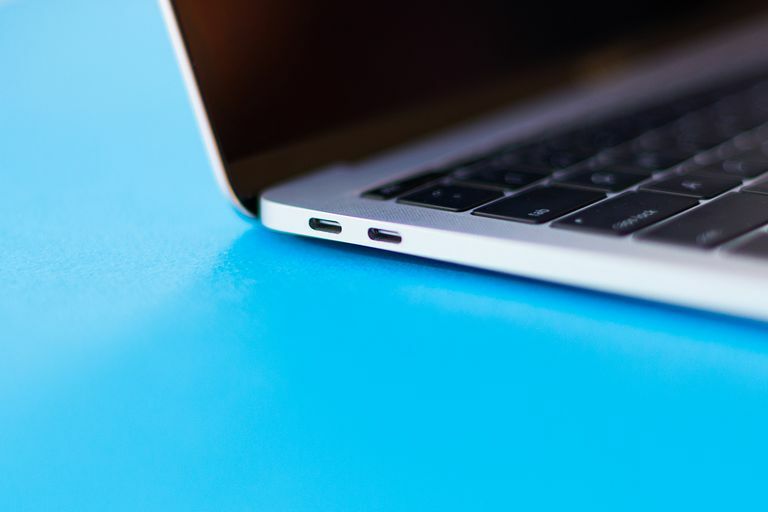 As the name implies, Thunderbolt is fast, but more importantly, a Thunderbolt port is versatile and uses the common USB-C connector to connect to most devices. Among all the types of peripherals supported by Thunderbolt, we decided to examine the top six types of devices you're likely to connect to your computer's Thunderbolt port. Thunderbolt 3 supports connecting multiple displays to your computer by sending video through the Thunderbolt cable using DisplayPort 1.2 video standards. This allows you to connect any monitor that uses DisplayPort or one of the compatible types of connections, such as mini DisplayPort. Thunderbolt 3 supports connecting two 4K displays at 60 fps, one 4 K display at 120 fps, or 1 5K display at 60 fps. To use a single Thunderbolt connection to connect multiple displays, you'll need either a Thunderbolt-enabled monitor with the ability to pass through the Thunderbolt connection (it will have a pair of Thunderbolt labeled ports) or a Thunderbolt 3 Dock. Thunderbolt's video tricks don’t stop with connecting DisplayPort-enabled monitors. With the right cable adapters, HDMI displays and VGA monitors are also supported. In all of its forms, Thunderbolt supports Ethernet networking protocols. This not only means you can use a Thunderbolt to Ethernet adapter cable to connect to a 10 Gb Ethernet network, but that you can also just use a Thunderbolt cable to connect two computers together at up to 10 Gbs in a super fast peer-to-peer network. Using the peer-to-peer networking option is a great way to quickly copy a large amount of data between the two computers, such as when you upgrade to a new computer and need to move your old data over. No more waiting overnight for the copying to complete. Thunderbolt 3 provides data transfer speeds up to 40 Gbps, making it a very attractive technology for use in high-performance storage systems. Thunderbolt-based storage systems are available in many formats, including single bus-powered devices that can be used for booting your computer while usually providing a nice increase in disk performance over what is natively available with internal boot drives. Multi-bay enclosures using SSDs and various RAID configurations can boost disk performance beyond the speed needed for producing, editing, and storing multimedia projects. Of course, you don’t have to be looking for the highest performance storage subsystem. Perhaps your needs have more to do with the amount of storage and reliability. Thunderbolt 3 can allow you to make use of a large number of relatively inexpensive disk drives to create a large mirrored or otherwise protected data storage pool. When your computing needs require highly available storage, Thunderbolt 3 can help meet those needs. Thunderbolt 3 supports multiple connection protocols. So far, we've seen how video and high-performance storage needs can be handled. Thunderbolt 3 also includes support for USB 3.1 Gen 2, as well as earlier USB versions. USB 3.1 Gen 2 provides connection speeds up to 10 Gbps, which is as fast as the original Thunderbolt specification and is certainly fast enough for most general-purpose storage and external connection needs and likely will meet the needs of many prosumers with multimedia needs. Connections to USB-based devices make use of just a standard USB-C cable, which is sometimes included with USB peripherals. This, along with an overall lower cost of USB 3.1 peripherals, makes those Thunderbolt 3 ports on your computer very desirable. USB 3.1 Gen 2 speeds of 10 Gbps make storage systems using this technology attractive since they have the bandwidth to fully utilize solid state drives using SATA III connections. This type of connection is also a good choice for dual-bay RAID enclosures for either standard disk drives or SSDs. We tend to think of Thunderbolt 3 as just a simple cable that can perform at high speeds. But the technology behind the Thunderbolt port is based on the PCIe 3 (Peripheral Component Interconnect Express) bus system that's used for connecting computer components together. One of the components that commonly uses this form of connectivity is the graphics card or GPU inside your computer. And since it connects via the PCIe interface within the computer, it can also be connected externally using a PCIe expansion chassis with a Thunderbolt 3 interface. Having the ability to connect an external graphics card to your computer allows you to easily upgrade your graphics. This is especially true with laptops and all-in-one computing systems that are notoriously difficult, if not actually impossible, to upgrade. Adding an external graphics card is just one way this technology can be helpful; another is the use of an external graphics accelerator that works with pro apps to speed up certain complex tasks, such as rendering used in 3-D modeling, imaging, and filmography. Courtesy of MacSales.com - Other World Computing. Our last example is the Thunderbolt Dock, which you can think of as a port breakout box. It takes all of the port types supported by Thunderbolt and makes them available in one external box. Docks are available with various numbers and types of ports. In most cases, a Dock will have a number of USB 3.1 ports, DisplayPort, HDMI, Ethernet, Audio line in and out, optical S/PDIF, and headphones, as well as a Thunderbolt 3 pass-through port so you can daisy-chain additional Thunderbolt devices. The various Dock manufacturers have their own blend of ports. Some may add older FireWire interfaces or card reader slots, so it's a good idea to peruse each manufacturer's offerings for the ports that you need the most. Docks also provide versatility, allowing you to have more connection points that can be used simultaneously and prevent the need to plug and unplug a number of cable adapters to connect up a peripheral you need.